Piazza San Marco with the Basilica in the Background. You must sit and people watch at one of these cafes in the square. Don't be fooled into dining here though, mediocre food and steep prices. The allure of Venice seduces visitors and I admit it, me, with its old-world charm, scenic vistas, spectacular architecture and a culture unlike any place I have seen! Once a mighty empire that controlled major trading routes between Europe and the East, Venice prevails today as a major tourist destination, on which it relies heavily for its sustenance. Standing testament to the power and wealth once enjoyed by Venice, are magnificent basilicas, palaces and squares or campi decorated with some of the finest paintings, frescos and sculptures in the world. From Byzantine and Gothic to Renaissance and Baroque, these awe-inspiring edifices remain standing after 500 years and are uniquely Venetian! If you’re planning a visit to Italy, make sure you include the “city of love” on your itinerary. Simply put, there’s no place in the world like Venice! Around every corner, canal or calle, a picturesque postcard is waiting to take your breath away. Piazza de San Marco Campanile - you must take the elevator or walk to the top for spectacular 360 views of Venice. I fell in love with Venice from the moment we arrived at Piazzale Roma, the train station, and boarded our vaporetto for a thrilling adventure down the two-mile Grand Canal to the Castello sestiere or neighborhood, one stop after Saint Mark’s Square. From there, we traversed a labyrinth of bridges, fondamente and calle or alleyways, to our Hotel Palazzo Priuli located a short distance from Saint Mark’s Square or Piazza San Marco. From that moment on, we were under the betwitching spell cast by Venice herself, unavoidable in under all circumstances. Once you're here, immerse yourself in the enchantment and grandeur of this timeless city! Fondamenta De l'Osmarin as seen from our balcony at the Palazzo Priuli Hotel. Spectacular and ornately decorated cas or houses such as the Casa Biondetti line the Grand Canal end to end. Close up of the fresco that adorns Casa Biondetti on the Grand Canal. 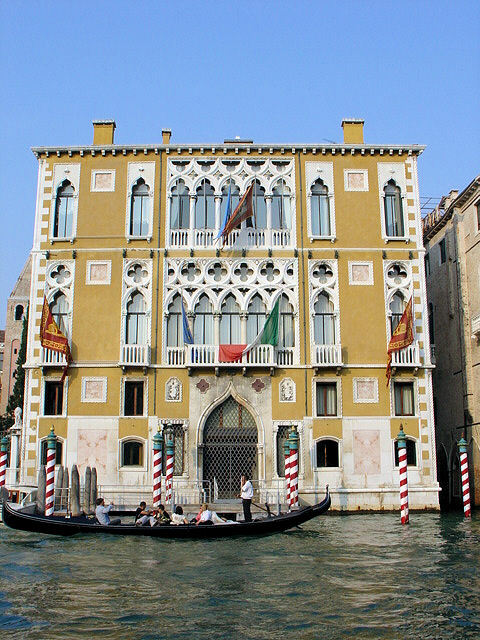 Venice Cavalli-Franchetti Palace Along Grand Canal. Basilica de San Marco and Palazzo Ducale. The campanile is just to the left of this viewpoint. Santa Maria Assunta aka Chiesa dei Gesuati was designed by Giorgio Massari and built by the Dominican Order in the early 18th century. Inside, an elaborately decorated nave that soars to dizzying heights and a baldacchino similar to that of St. Peter's in Rome. If there is one piece of advice I can impart to anyone who visits Venice, it is to get lost within its labyrinth of streets and alleyways. You're sure to discover something wonderful! 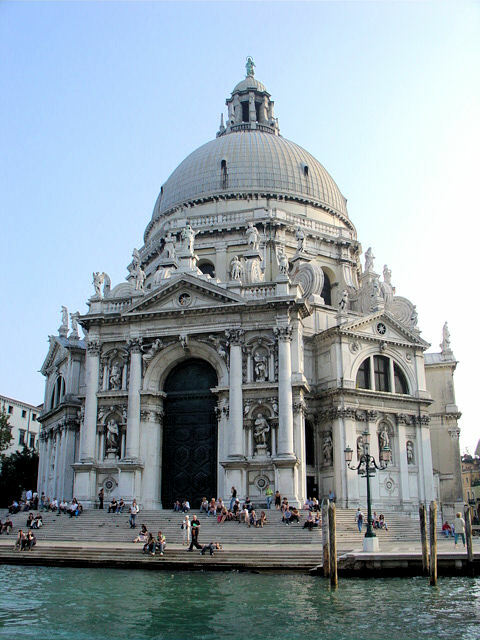 The Church of Santa Maria della Salute in Venice. El Teatro de Fenice or the Fenice Theatre restored to its former glory before a devastating fire burned the centuries-old theatre almost entirely to the ground. A most wonderful book "City of Fallen Angels" by John Berendt recounts the story from the 1996 fire through its grand-opening debut in 2001 - a fascinating read of historical facts, socialites and scandals, and an insider's view into the mysterious lives of Venetians! Loved every word of it! I strongly recommend you plan for an afternoon excursion to Murano - the historic island just east of Venice where Venetian Glass has been crafted by artisans for more than 1,000 years. Just hop onto a vaporetto or if you have a few extra Euro, let me suggest a water taxi for a thrilling ride across the lagoon. Another island in the lagoon—Burano— should be included on your itinerary as well. Check out this post by TravelsOfAdam showcasing Burano's picturesque windows. 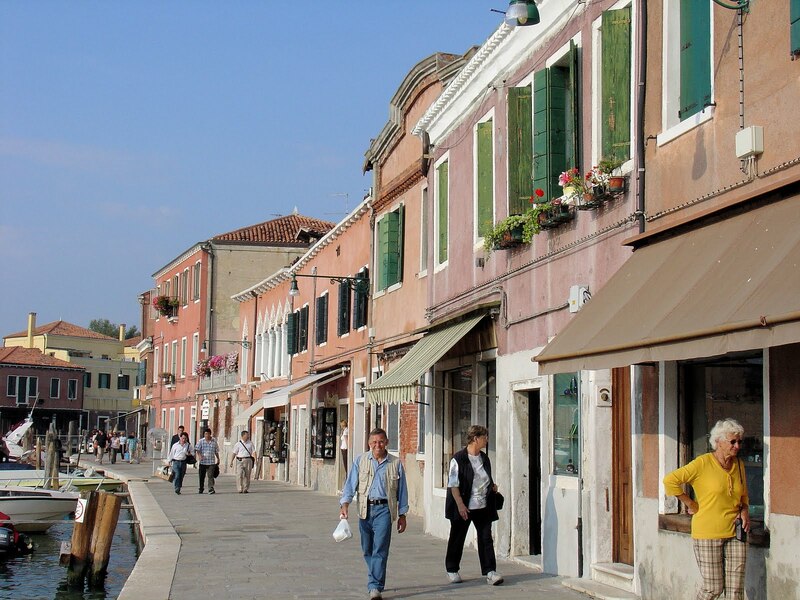 Welcome to Murano, the island of Venetian Glass. Murano's Grand Canal is lined with shops brimming with everything in Venetian Glass from baubles to chandeliers to exotic masterpieces of art. Although somewhat expensive, a cruise through the ancient canals of Venice aboard a legendary gondola makes for a perfect afternoon and an even more enchanted evening tour. Check out this video tour with Rick Steves on one of the celebrated gondolas as it snakes through the quaint and charming canals of Venice. Recently, I just finished Peter Ackroyd’s “Venice: Pure City” – a most fascinating read for historians and travelers alike. Ackroyd takes us on a journey beginning with the retreat of ancient Venetians to these islands back in the fourth century and from there, he recounts Venice’s rise from the lagoon to one of the most powerful mercantile empires in the world! We experience art, culture, wartime, scandals and end at its present-day status as a tourist destination. Loaded with 1,600 years of meticulously crafted details and facts, Ackroyd’s “Venice: Pure City” is the penultimate encyclopedia on this ancient city! Absolutely wonderful collection of photos here. I love Venice, and these just reminded me why! Thanks so much for stopping by and sharing your dreams of going to Venice!! Everyone has to see Venice at least once in their lives...and when they do, they too will fall in love!!! Thank you for your compliments too! Thank you so much for your thoughts and for visiting and commenting and the site. I truly appreciate it!!! And, I totally agree with you about loving Venice...I was there for 5 days and had an amazing experience through this ancient city!! Thx again. Ha Lesley...you're right, they all do. And the Palazzo Ducale would be the most delicious ice cream cake topped with raspberries and the most creamy frosting!! Yum. Yes, the flooring in San Marco was designed to convey that very sensation of gently undulating waves beneath your feet. You know, they just don't design like that anymore. Thx for stopping by and sharing your thoughts! I miss it too!! Need to add Venice to our European tour!! Thank you for stopping by and sharing your thoughts!!! Awesome photos! I'm heading to Verona for a conference in a few days and looking forward to getting lost in a new city! Thank you so much April for your compliment. Getting lost in a city is one of the most fascinating ways to discover its vibe, its essence and culture; and Venice holds true to that in every way. Ah Verona, the city of Juliet! After seeing Letters to Juliet, I have added this wondrous city to my bucket list. I hope you have a fantastic time and be sure to post the chronicles of your journey on your facebook page, which I liked by the way. Thank you for stopping by and sharing your thoughts!! Jeff, You captured the essence of Venice beautifully! Thanks for sharing. I am honored by your kind words my friend...especially from someone who really knows and understands the pulse of Venice like you do!! Thank you so much for stopping by and sharing your comment! I really appreciate it! Anyway, the church that you have referred to as "Jesuit Church", actually is called "Chiesa dei Gesuati", the "Gesuati" were a religious order that had nothing to do with the Jesuits! 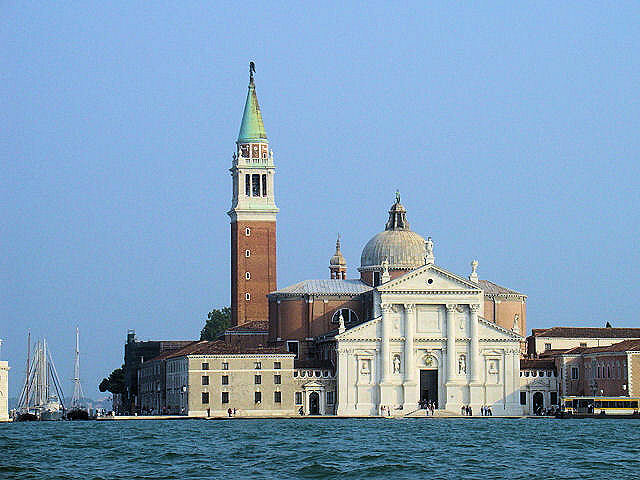 The Jesuits Church in Venice is located on the opposite side, towards the North Lagoon. Thanks you so much for the comment and correction. I have updated as you instructed and I want to thank you for taking the time to let me know about the error. Hi there Wenda and thank you for all of your kind words. I really appreciate it!! These photos were taken with a Sony Cybershot camera...my quick and easy traveling camera when on fast-moving tours. Thank you so much for stopping by and sharing your thoughts. It is really a charming travel destination! I'd love to tour around there too if schedule permits..
Hi there my friend and thx so much for stopping by. I agree, charming, mystical, enchanting, and timeless! You must wander in Venice and get yourself lost...part of the initiation into Venetian society and you'll have the time of your life! Attractive photos of Venice are common but these photos are stunning. Especially struck by the full shot of the Basilica of San Marco. We have visited once but these photos entice us to visit and to spend time enjoying its attractions. Hi there Tim! I am honored and flattered beyond words by your compliments! Thanks so much for every word!! Now it's time to make your triumphant return my friend! I must say that It is really a charming travel destination! I wish I will also go there if I get some holiday from my office.